The Timewise 798A Time/Speed/Distance Rally Computer is designed with the sophisticated requirements of "perfect time" road rallying in mind. Non-slip switch actuators on detent action toggle switches give positive operator feedback, even on the worst of roads. Switches are logically grouped by function and are placed far enough apart so that accidental activation of the wrong switch is minimized. A single rotary switch eliminates a confusing array of closely spaced pushbuttons. All course parameters are shown on ultra-bright, 0.4" tall LED displays to assure easy readability, even in bright light. For nighttime use, the LEDs can be dimmed to lower intensity levels. The use of large scale integrated CMOS technology keeps component count and power dissipation to a minimum, while simultaneously providing increased reliability. The 798A uses a microcomputer designed for industrial environments where speed, efficiency, resistance to electrical noise, and insensitivity to adverse ambient conditions play a significant role in product specification and selection. Every safeguard was used to assure continual operation in the harsh environment of a rally vehicle. The 798A rally computer provides the rallyist with precise time, speed, and distance information needed during a "perfect time" road rally. A quartz crystal oscillator and full featured, custom programmed microcomputer control all functions of the instrument. Dual odometers measure distance to a resolution of 0.001 mile (or kilometer). Distance on the main odometer reads a maximum 999.999 miles (kilometers) before reverting to 0.000. An auxiliary odometer, generally used for incremental measurements, also reads to 999.999 miles (kilometers). These two odometers count up or down in unison, or they may be frozen (parked) at their current values. The two odometers may be independently reset to zero. The main odometer may be set to any value. Optionally, the auxiliary odometer may be adjusted to any value. Two odometer inputs are provided. The odometer sensor(s) simply plug into a connector on the 798A. There are also two adjustable odometer factors per input: one for dry pavement, the other for gravel or snow. Distance measuring accuracy is assured by the use of a six-digit factor, allowing adjustments to one part in one hundred millionth of a mile. An odometer input pulse signal conditioner/divider allows you to connect the odometer input of the 798A directly to high pulse rate electronic speedometer signals now available on many vehicles. Automatic odometer factor calculation is also provided. Time of day is displayed in hours, minutes, and seconds/tenths (12:59:59.9). Alternatively, the clock can run in the format of hours, minutes, and hundredths/thousandths of a minute (12:59.999). The time of day clock can be quickly set to any hour, minute, and second (or hundredth of a minute). You can switch between counting in seconds or hundredths at any time; and, you can synchronize the beat of the clock to a time standard at any time. 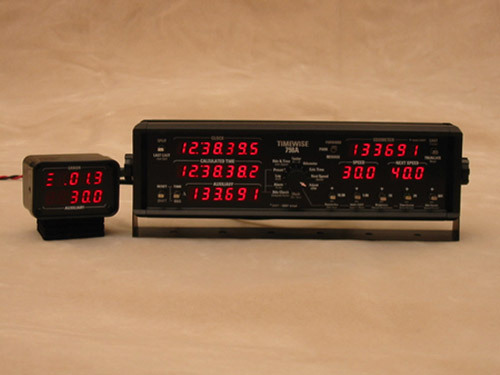 If a Timewise multi-split checkpoint clock is accessible, the 798A can be automatically synchronized to the checkpoint clock via a simple cable connection. A battery-backed real time clock (RTC) is standard. This feature keeps the clock counting whenever primary power is removed from the 798A. In addition, the odometer factors, all distance and time measurements, personal setup selections, etc. are retained during power down. The 798A is instantly ready to use when power is re-applied. Another display shows the ideal time of arrival at every point along the rally course. This calculated value is derived from distance measurements taken by the 798A and from course speeds (CASTs) entered into the 798A by the rallyist. The calculated time can be held at its present value while measuring distance, thus providing transit zone and warp speed capabilities. The computed course time is also used to provide a calculated time stopwatch. This auxiliary time display shows the ideal transit time between any two points on the course. A remote driver's module displays a driving time error of -9.999 to 59.999 minutes (or, minutes:seconds.tenths). This constantly updated figure is computed from the data in the real and calculated time clocks. Keeping this figure at 0.000 means you are "on time". The driver's display can be disconnected and re-connected at any time. A second display in the driver's module can show one of the following: the active CAST, the vehicle's actual speed (resolved to 0.1 mph), the difference between the CAST and your actual speed, the countdown distance to a preset alarm mileage, a duplicate of the main odometer, or a duplicate of the auxiliary odometer. Vehicle speed is mathematically corrected to official course mileage and is updated approximately twice per second. A split mode visually freezes all parameters on the main computer. After releasing the 798A from the split mode, figures update to current values. A recall mode lets you subsequently review the previous split values. Parameters displayed in the driver's module continue to update whether or not the main computer is split. After switching to a new CAST, you may subsequently modify the CAST value to correct an erroneous entry. Two CAST displays are provided: one for the active speed, the other for the next expected speed. Virtually all parameters within the 798A can be adjusted, either independently or in combination. For example, when correcting the main odometer, automatic computation and entry of a correction for course time is possible. Changes can be made while course parameters are split or free running. A confirmation of the change is available in a resettable "amount of change" display. Subsequent to a CAST change, you may recall values that were present in the 798A at the moment of that CAST. Further, you can adjust the CAST execution mileage to a new value and the 798A will automatically correct the calculated time, appropriately using the old and new CAST speeds in the re-computation. The 798A is supplied with a battery-backed datalog memory that will store course parameters present upon execution of the last 56 splits and CASTs. You can review this logged data at any time via the front panel. Rear panel inputs allow you to remotely execute a CAST, remotely split all values (with simultaneous reset of the auxiliary odometer), or remotely enter the Park mode. There is also an input jack which allows the automatic synchronization of the clock within the 798A to the time of day in a Timewise checkpoint clock. The 798A includes a Model 398-3 driver's module and the above listed features. Additional features and options, such as a locking Forward/Park/Reverse toggle switch (option 12) or the addition of a remote control input to select an alternate parameter in the driver's Auxiliary display (option 7), can be added to the 798A. This 121 page document (368KB) includes a complete functional description of the 798A, as well as detailed specifications, installation procedures, and a sample rally with step by step procedures for operating the 798A. To access a two page Timewise 798A brochure in PDF format, click here.